MTV has just launched their new MTV Music website where you can view their entire catalog of music videos. Yes, I know that's what we all thought the TV channel was supposed to be but whatev. The important thing is to behold the power of nerds on the internet. 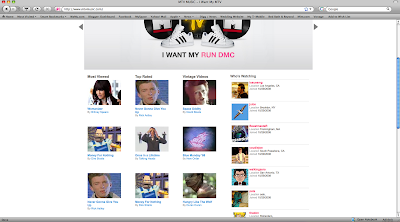 Rick Astley is both on the Most Viewed and Top Rated lists. Absurd. p.s. For those of you who don't know what a rick roll is... it's an internet meme where someone posts a mislabeled video link that takes you to the Rick Astley's "Never Gonna Give You Up" music video. For example, someone might claim to have a video of Obama praising socialism and you'd click and exclaim "I got rick rolled!" Yeah, I think it's kinda dumb too but ask Nate to tell you about the real life rick roll in his office.